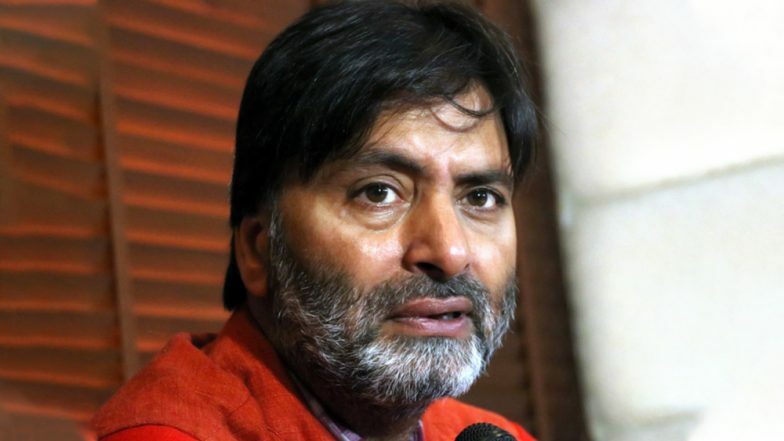 New Delhi, March 22: The Jammu & Kashmir Liberation Front (JKLF), headed by top separatist leader Yasin Malik, has been banned by the central government. The Ministry of Home Affairs (MHA), on Friday, issued an order banning the JKLF under the provisions of the Unlawful Activities Prevention Act (UAPA). Union Home secretary Rajiv Gauba said the action has been taken against JKLF for promoting secessionism in the Valley. The group's leader, Yasin Malik, has been reportedly involved in several demonstrations during which the youth have also resorted to stone pelting. Jamaat-e-Islami of Jammu & Kashmir Banned Under UAPA. "A large number of secessionist leaders were being provided security by the state, this matter has been reviewed. And after review, security of many such persons has been withdrawn and this process of review will continue further," Gauba said. Days before the order was issued to ban JKLF, Malik was taken into arrest for alleged links to Pakistan-based elements who are allegedly financing the insurgency movement in the Valley. Malik, a militant-turned-political activist, is one of the three top separatist leaders in Kashmir. The other two are: Hurriyat's supreme leader Syed Ali Shah Geelani -- currently under house arrest -- and Hurriyat (Moderate) faction Mirwaiz Umar Farooq. The foundation of JKLF dates back to 1977, when the organisation was involved in active militancy. In 1994, under Yasin Malik, it transformed into a "peaceful separatist movement". The group, prior to turning away from militancy, was charged of playing a key role in the exodus of Kashmiri Pandits.